With the start of fall, it’s no surprise that pumpkin spice has made its reappearance. From the Pumpkin Spice Latte at Starbucks to pumpkin spice almonds, eggnog, and candles, there is no end to the craze in sight. In fact, this craze has been going on for years, since 2003, when the first Pumpkin Spice Latte reached consumers. 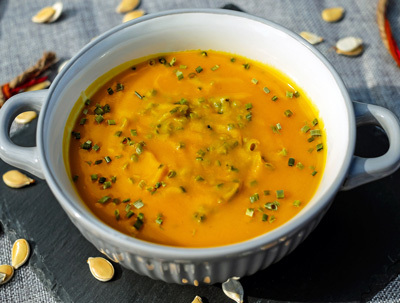 Pumpkin and other winter squashes have been making waves, and have been fall and winter staples for hundreds of years. So how has this orange squash managed to win over so many hearts, and is it really a great food to splurge on in the fall? In this blog post, we’ll take a critical look at the pumpkin and help you understand why the pumpkin is a scrumptious fall choice. Like corn, we can thank the Americas for providing us with the pumpkin. While it can’t be for 100 percent certain that the pumpkin originated in Central America, archaeologists have found seeds there dating back to at least 5,000 BC. The thought is that the European colonization of the Americas in the 1500s and 1600s led to the exchange of many plants native to specific continents, including the pumpkin. The pumpkin can now be found on every continent around the world except Antarctica. However, Americans are still some of the most voracious consumers of this delicious squash variety. 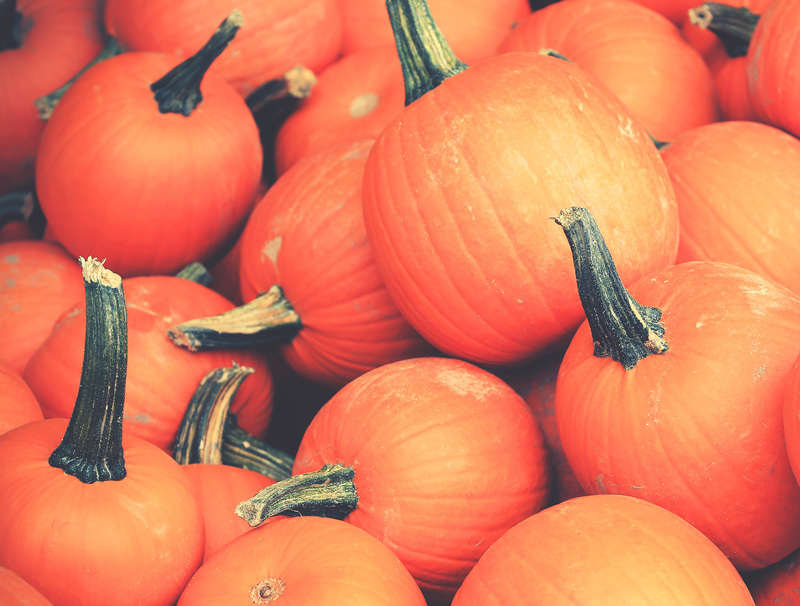 While we may enjoy jack-o-lanterns on Halloween and the occasional latte, pumpkins are great foods to consume in general. That’s why we think they should be included in our tips for healthy living! Keep in mind that, for a healthy food option, you’ll want to ditch the latte, and reach for the whole, raw vegetable. When used in cooking, pumpkins can be an incredible source of fiber and can also pack a punch with plenty of beta-carotene, vitamin A, and vitamin C. What does this mean for you? It means that you’re helping out both your immune system and your eyes to do their best when you consume healthy sources of pumpkin. So feel free to dig in, and if you’re not quite sure where to start, try a few of the following recipes. For savory pumpkin pancakes on a cold morning, you just need to turn to this recipe. It’s a great way to get in your veggies in a fun way. And if you’re gluten-free, just replace the whole wheat flour with chickpea flour, or your favorite gluten-free flour blend. 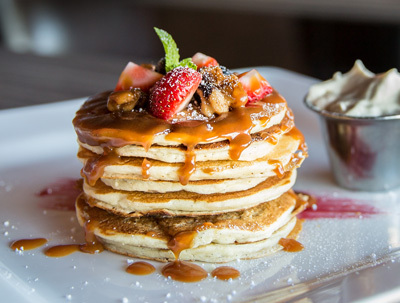 Once you’ve made your pancakes, just serve them with a dollop of sour cream or chutney to enjoy. Combine of your ingredients in a bowl, adding the soda water last and saving a few green onions for garnish. Whisk ingredients into a moist batter. Heat a griddle to medium high heat, and add the olive oil. Spoon batter onto the griddle. Flip pancake when small bubbles start to form. Cook evenly on both sides and then serve. Dollop a small spoonful of sour cream on top and sprinkle with a few raw green onions. Enjoy! During the winter season, chili is always a popular choice. But it’s hard to splurge on chili when you just toss in ground beef, beans, and tomatoes. 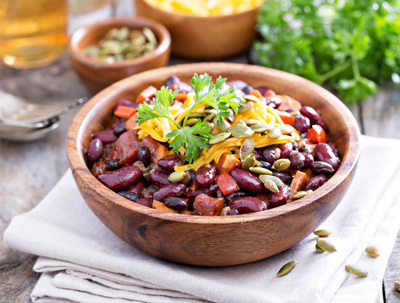 This recipe takes everything you love about chili and pushes the boundaries on flavor while still remaining a healthy choice. Brown ground turkey in a large Dutch oven or cooking pot. Add in onion, bell pepper, and garlic. Let cook for six to eight minutes. Add in seasonings except fresh cilantro. Add pumpkin, black beans, tomatoes, and broth. Stir thoroughly. Bring to boil and then reduce to a simmer on low heat. Cook for 20 to 30 minutes, until the pumpkin is tender. Serve, garnish with fresh cilantro, and enjoy! Nothing says fall quite like a good soup. Whether you serve it as an appetizer for Thanksgiving or just make it for dinner on a regular basis, this soup is filling, savory, and vegetarian when you use vegetable broth. Whip up a batch in your kitchen today! In a stock pot over medium heat, melt the two tablespoons of butter. Add the diced potato and onion to the butter and cook for roughly eight minutes, until the onion is translucent. Add broth and bring to a boil. Cover and reduce heat to low. Cook 10 to 15 minutes, until the potato is tender. Grab your immersion blender and puree until smooth. Bring to a boil again and then reduce heat to low, allowing to simmer for an additional 10 minutes. Add cream and allow to heat thoroughly. When it comes to living a healthy life, making sure you’re eating a diverse amount of fruits and vegetables can go a long way. Food is key to life, and your choices can influence how you feel and the nutrition you receive. Quality ingredients and diversity are important. However, when you need some help, turn to the Harmony Company for quality, natural health supplements to fit your lifestyle. Shop online with us today!